The concept of judging a book by its cover can have its music analogy in how deep you go past the musical overlay to analyse the lyrical content and meaning of the songs. Obviously it’s down to personal preference to what importance you attach to the depth of a recording and after all, music is such a subjective form of entertainment. WHEELHOUSE , the latest studio album release by leading Nashville artist Brad Paisley is a multi-faceted record that will please both camps. Those with deep pretensions will love to delve into the inner southern naval gazing observations of Paisley while there is sufficient merit in the multitude of ear pleasing country rock and pop anthems to satisfy the casual consumer. Vast amount of media coverage has emerged over Paisley’s attempt to appease the southern racial stereotype in ‘Accidental Racist’ and while it may appear to have been a brave move from the conservative heartland, he is hardly perceived as a great radical. As an artist probably at the peak of his creative powers, the collaboration and interaction with LL Cool J has come across as a fairly explicit piece of prose which works as an album track but in my opinion doesn’t define the record. The potential for Paisley to be radical was given a greater opportunity in ‘Those Crazy Christians’ and while there is more than a hint of damnation in elements of the lyrics, his true unprovocative instinct led him to withdraw the full bible-belt assault in the song’s final line. The fact that the critics are analysing his work will no doubt please Paisley and this brings us to his swinging view of the southern lifestyle in ‘Southern Comfort Zone’ where you are not quite sure whether he is celebrating or damning the stereotypes. On the other issues he tackles, the retribution theme to domestic abuse in ‘Karate’ is fairly unique from a male artist but much more common in songs such as ‘Independence Day’ and ‘Goodnight Earl’, while ‘Death of a Single Man’ is a very clever and ironic slant on the sacred institution of marriage. It has been previously alluded to that WHEELHOUSE is a concept album but a more appropriate view would be to give it semi concept status with a string of threads. Away from the issue themed tracks, which incidentally also included a dark satirical view of death in ‘Harvey Bodine’ –aided by the comic input of Eric Idle, several other songs can be grouped together in their meaning and content. Amongst a collection of tracks that herald a positive take on life, two impressive numbers stand out to an extent that they can have their merits enjoyed by those reluctant to indulge in the meaning of life. ‘Beat This Summer’ is an excellent radio friendly feel good song that while possessing a pop vibe has a superb melody that imprints in your mind. The same can be said for ‘The Mona Lisa’ where Paisley captures the simple pleasures of life so effectively. It has to be said that there has been a little justified criticism in some of Brad Paisley’s albums being overly long and that the day he compacts his undoubted quality into a concisely packaged high impact product will be one to savour. At over an hour in duration and with twenty-one tracks on the widely available deluxe version, WHEELHOUSE is not this album but that is not to undermine the high standard of content from the top notch song writing team Paisley has assembled and his industry renowned majestic guitar playing skills. 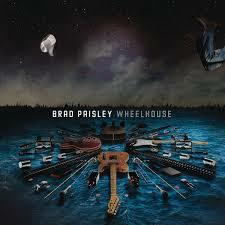 As to this being Brad Paisley's finest piece of work to date, that is hard to say as I haven’t analysed his previous material to this extent but close scrutiny of WHEELHOUSE has been a highly enjoyable and rewarding experience. 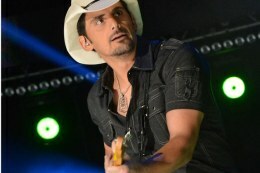 Maybe he is not yet one of Americana’s great radicals but Brad Paisley is an important progressive figure in contemporary country music and in my book the leading male exponent of the current fashionable crop. This album has cemented that position and whether you are somebody who wants join in the ‘Accidental Racist’ debate or just enjoy a pure listening experience to ‘Beat This Summer’ then this album is an essential acquisition.